A man armed with a knife killed two Ukrainian tourists Friday and wounded four other foreign holidaymakers, all women, at Hurghada resort, in the Red Sea, few hours after gunmen killed five security forces in their vehicle early in the morning, South of Cairo. The injured victims were 3 Serbians and one Polish, reports say citing Egyptian security sources. According to security forces, the man swam from a nearby beach to attack his victims. 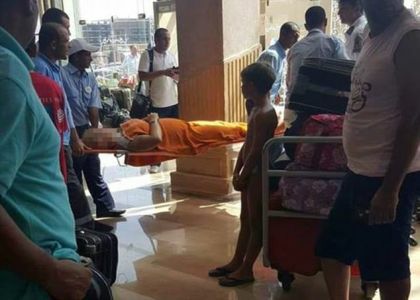 Pictures purportedly appeared to show him nabbed and pinned down inside a luggage cart by hotel staff. It is unknown why he carried out the attack. Islamist militants have in recent years targeted foreign holidaymakers. Last year in January, two assailants armed with a gun, a knife and a suicide belt landed on the beach of a hotel in Hurghada, wounding two foreign tourists. The Islamic State group (IS) claimed responsibility for the downing of a Russian passenger jet in 2015. All the 244 people on board, mostly Russian tourists, were killed. Russia swiftly suspended all flights to and from Egypt. In a separate report, three gunmen assaulted a police vehicle killing two security officers and three conscripts in an area of Badrashein, south of the Giza, 20 km South of Cairo, the interior ministry said in a statement. “A police officer who was near the site of the attack exchanged fire with the assailants forcing them to flee,” the statement said. Egyptian security forces have been battling insurgency in the Sinai Peninsula. But the attacks have spilled to urban areas including capital Cairo. Last week a double suicide bombing at a security checkpoint in the Sinai followed by shooting from IS militants left 23 security forces dead and dozens injured. The army later claimed it killed 40 militants in raids. The interior ministry also announced early this week the killing of six militants in Southern Egypt as security forces faced militants in gunfire exchange. Written by: KanelkaTagba on July 15, 2017. Posted by KanelkaTagba on Jul 15 2017. Filed under Headlines, World News. You can follow any responses to this entry through the RSS 2.0. Both comments and pings are currently closed.